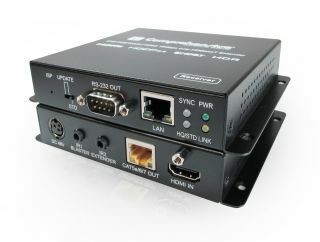 The What: Comprehensive Connectivity Company has launched the CHE-HDBT2020 - Pro AV/IT 4K 18G HDBaseT Extender TX/RX Kit up to 330ft, for extending UHD audio, video and ethernet up to 330 feet. The What Else: Comprehensive's CHE-HDBT2020 supports 18G, Ultra HD, 4K60, 4:4:4 color space, HDR and complies with the advanced HDCP 2.2 and HDMI 2.0 standards. This extender includes one transmitter and one receiver and is designed to convert a full HDMI signal to a standard HDBaseT signal, which can be transmitted over a single ethernet cable. It also supports bidirectional PoH, so there is no need to run additional power. This kit also includes two IR receivers and two transmitters, allowing for bidirectional infrared control of a connected HDMI source and display. The Bottom Line: Well suited for showroom displays, lecture halls, retail sales displays, and anywhere in between, the CHE-HDBT2020's components are RoHS compliant and come with a three-year warranty.